We’re not big fans of “top X lists” because they usually lack substance and are little more than conversation starters. However, Inside the Hall (Indiana basketball focus) and UM Hoops (Michigan) recently published a list of the “Top 25 Big Ten Players for 2013-14” that offered commentary on each player. Both websites produce excellent original content and are highly recommended reads for fans of college basketball. The top 25 players are listed below along with a link to the respective commentary pages. With respect to who is included in the top 25 and who is not, we think they did a pretty good job. Of course there are reasonable arguments for switching out a Terone Johnson for, say, Ben Brust, Josh Gasser, Joseph Bertrand or Sam Thompson. There is one exclusion, however, that we simply cannot rationalize. That is Minnesota senior guard Austin Hollins. We suspect he didn’t make the list largely due to his relatively low 18.7% usage rate, although others on the list had far lower usages. That said, Michigan’s Nik Stauskas (16.2%) and Glenn Robinson III (15.2%) both project to see a larger increase in their usage rate than Hollins does in 2013-14. Both Stauskas and Robinson had better offensive ratings than Hollins, but from an offensive Value Add perspective the Golden Gopher was better than Stauskas and the third best in 2012-13 of all Big Ten returners. This isn’t to say Austin Hollins should replace one of these two, rather we are simply saying that he belongs somewhere in the top 25. Robinson and Staukas had exceptional freshman seasons thanks to incredible shooting percentages (see eFG% above). In general, you’d expect a sophomore to improve his offensive rating sophomore year, but for reasons we’ll discuss more in our upcoming team previews we do not project either player to have a higher offensive rating or to shoot as well in 2013-14 (i.e., Burke and Hardaway to the NBA; shot selection; projected increase in usage; GRIII’s 65.2 2FG% w/~75% 2FGAs at the rim & ~two-thirds of those assisted; Staukas’ 44.0 3FG%, etc.). Meanwhile, Austin Hollins had a down year shooting the three (33.8% 3FG, down from 37.0% as a sophomore). We project that Hollins will improve on his 2012-13 3FG% performance as a senior. The strong assist rate posted by Hollins brought up his offensive rating as compared to the two Michigan freshmen, who each were rarely credited with setting up a teammate. 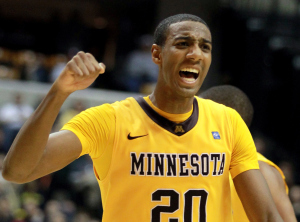 Speaking strictly offense we believe Austin Hollins has to be in the top 25 of all Big Ten players for 2013-14. Once you add in defense (especially compared to a Nik Stauskas), it’s even more clear that Austin firmly belongs. His 3.7% steal rate and low 2.5 fouls called per 40 minutes were impressive, even though his 4.4% steal rate as a freshman was even better. Late Night Hoops is on Twitter @LateNightHoops. Previous PostGopher Targets Will be Well Represented at USA CampNext PostJerry Kill: Winning Helps Everything?